An update of an old post, posted in November 2011. Heat up oil in wok and saute the chopped garlic and ginger until fragrant. Keep stirring and add curry powder with 1 tablespoon of water. Stir until the chicken is cook. Combine all the ingredients under 'batter' in a mixing bowl. If you have the 'Kuih Cara' mould ~ heat up the mould (stove top), brush with oil and spoon the batter half way up the mould. And if you dont have one... use frying pan instead (make into pikelet size). Top up the batter with the cooked chicken and cooked prawns. Cover and cook using low heat until 'Kuih Cara' is cooked through. 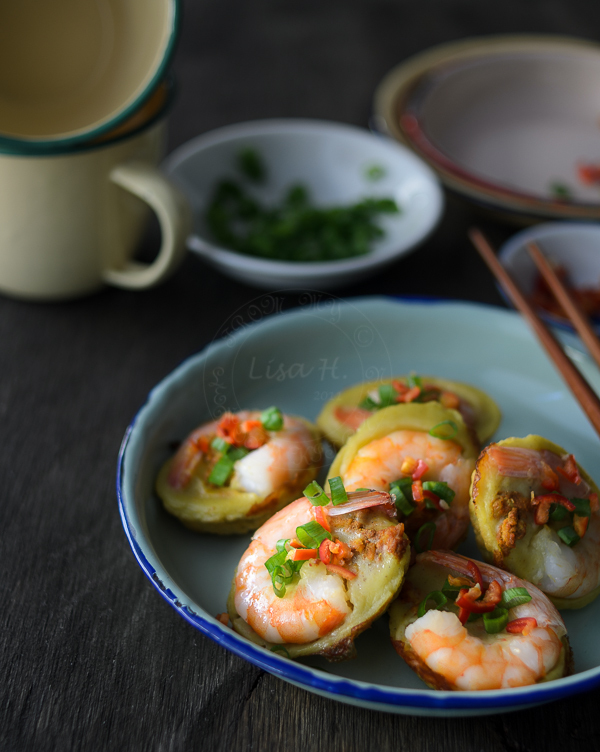 Serve with thinly sliced spring onions and chilli. beautiful presentation as always, Lisa.. What substitute for custard powder is ? you can try cornflour (I have not try it myself). Oh, heavenly bites! That is such a great dish/recipe. I really like the flavors/spices to make this dish. It would go well on fish or chicken. These look so good. I love this type of good, such great flavours. These look so delicious and are such a great presentation for a party! These little shrimp bites look amazing!! Thanks for sharing! This recipe sounds all sorts of amazing The hubs and I would love to try this recipe soon,yum! If not, your precious comment will not be published ... sorry. and One more thing...No Spamming!! !